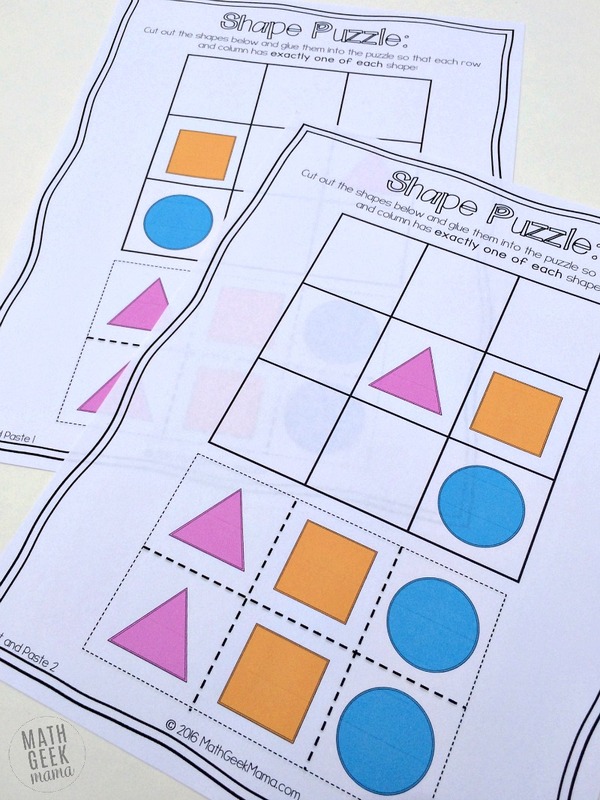 My oldest were thrilled with this set of pattern block puzzles that I shared recently (get the entire ebook of puzzles here!) and so I decided to make a simpler version for my younger kiddos. 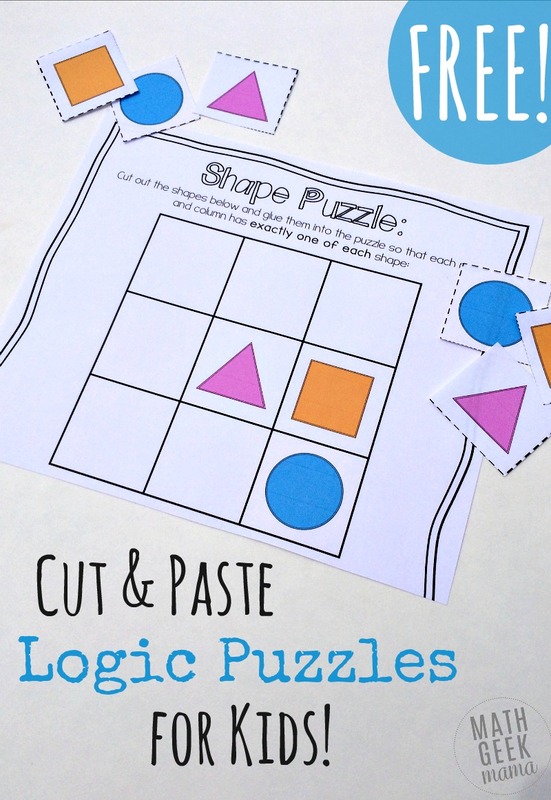 These cut and paste logic puzzles are simpler (they are only 3×3 squares instead of 4×4) but still a fun way to get kids using their logical reasoning skills, and learning shapes and colors at the same time! First have your kids cut out the shape cards at the bottom of the puzzle. Depending on the age of your kids, they may need some help with this. 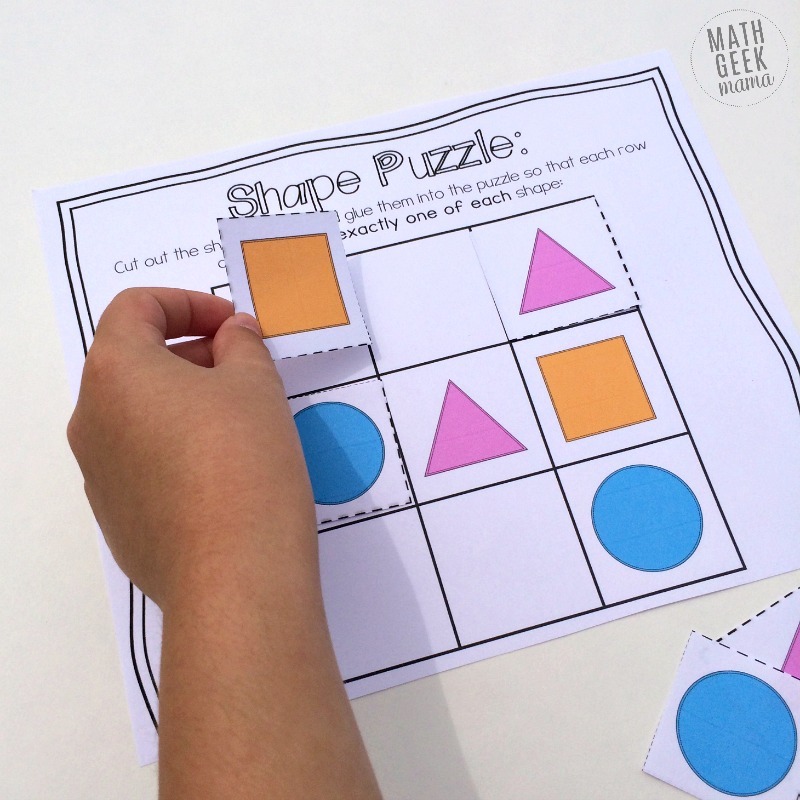 You can also take some time to review the shapes and have a discussion about where they see these shapes around them. For instance, ask them to point out a square in the room or name something that is a circle. Then, explain that each row and each column must have one of each shape, without repeating. 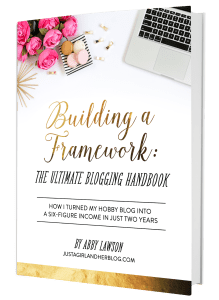 While it may be tempting to also point out the row or column that already has two of the shapes and lead them to figure out which one must be missing, step back and let them try first! 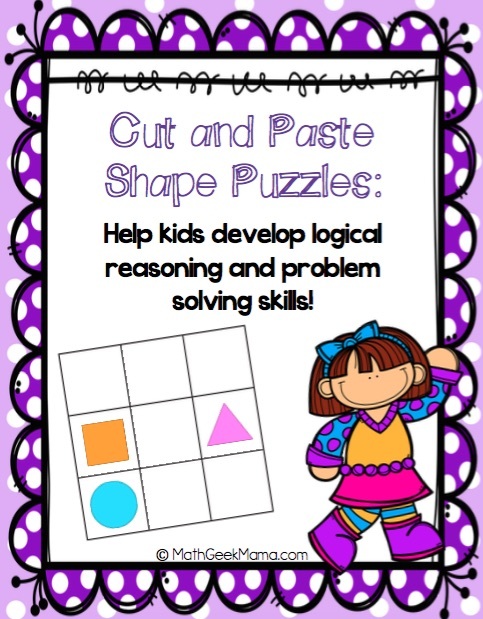 The point of these puzzles is to help kids learn to think and problem solve and use logic. So give them the space to think through it on their own. If they complete the puzzle and have repeating shapes in a row, simply show them WHY that’s not right (“I see there are two circles in this row. You need to have one of each shape. How can you fix it?”) rather than explaining how to solve it. 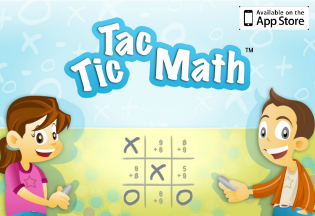 I guarantee they will catch on quickly and be able to solve the first and the rest of the puzzles independently. Once they have correctly solved the puzzle, allow them to glue the pieces down in the correct squares. Try to be careful that they solve the puzzle first, before glueing, so that they aren’t trying to pull up and move around pieces that have already been glued. 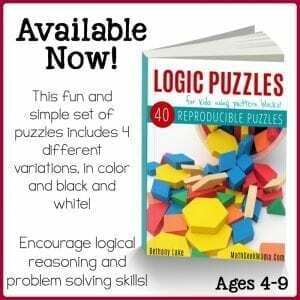 And once they’ve got the hang of these puzzles, try these pattern block logic puzzles! 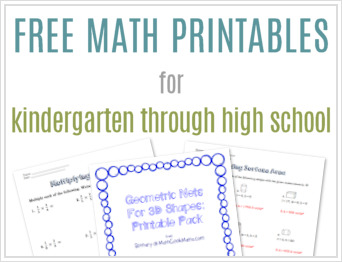 These fun, hands on challenges will keep kids busy and get their brains thinking! LOVE this idea? 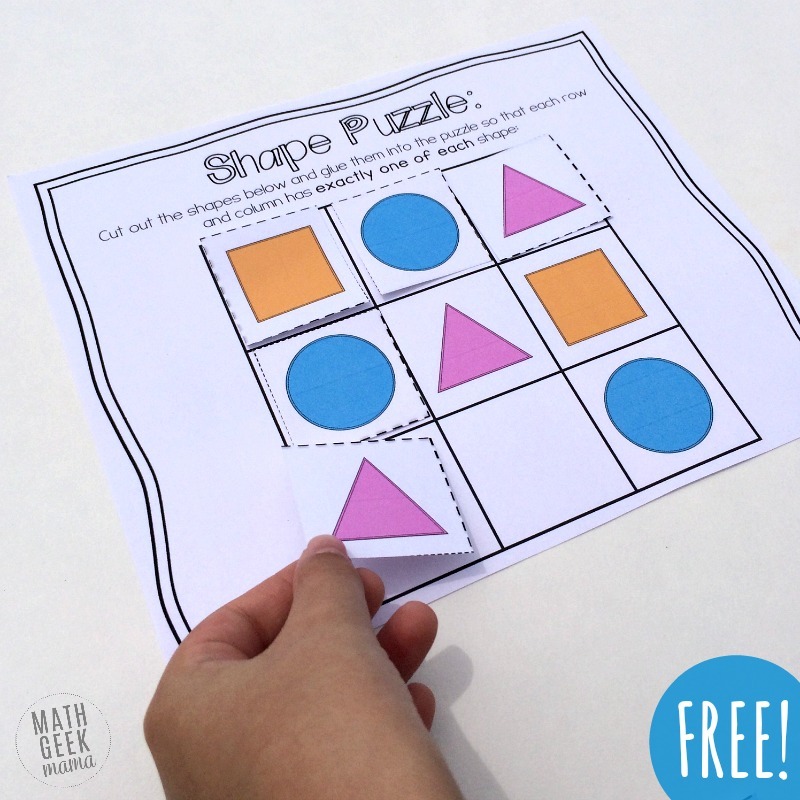 Grab my ebook packed with fun, hands on puzzles for kids ages 4-9!